The directory is made up of databases, and the directory tree is distributed across the databases. This chapter describes how to create suffixes, the branch points for the directory tree, and how to create the databases associated with each suffix. This chapter also describes how to create database links to reference databases on remote servers and how to use referrals to point clients to external sources of directory data. Different pieces of the directory tree can be stored in different databases, and then these databases can be distributed across multiple servers. The directory tree contains branch points called nodes. These nodes may be associated with databases. A suffix is a node of the directory tree associated with a particular database. For example, a simple directory tree might appear as illustrated in Figure 2.1, “A Directory Tree with One Root Suffix”. The ou=people suffix and all the entries and nodes below it might be stored in one database, the ou=groups suffix in another database, and the ou=contractors suffix in yet another database. A root suffix is the parent of a sub suffix. It can be part of a larger tree designed for the Directory Server. A sub suffix is a branch underneath a root suffix. 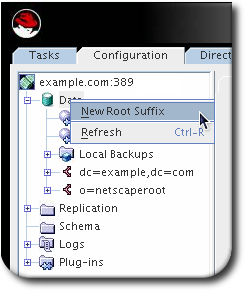 Both root and sub suffixes are used to organize the contents of the directory tree. The data for root and sub suffixes are contained in databases. A directory might contain more than one root suffix. For example, an ISP might host several websites, one for example.com and one for redhat.com. Here, two root suffixes are required, one corresponding to the dc=example,dc=com naming context and one corresponding to the dc=redhat,dc=com naming context, as shown in Figure 2.2, “A Directory Tree with Two Root Suffixes”. It is also possible to create root suffixes to exclude portions of the directory tree from search operations. For example, Example Corporation wants to exclude their European office from a search on the general Example Corporation directory. To do this, they create two root suffixes. 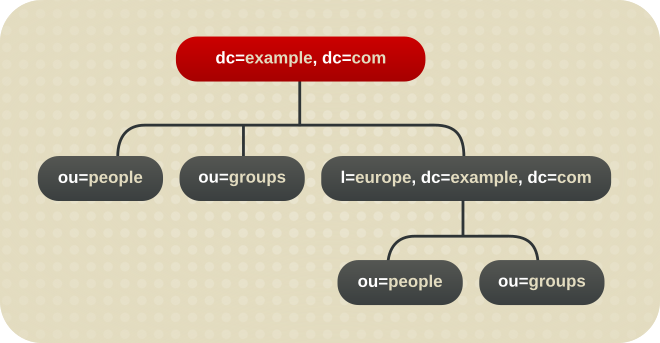 One root suffix corresponds to the general Example Corporation directory tree, dc=example,dc=com, and one root suffix corresponds to the European branch of their directory tree, l=europe,dc=example,dc=com. From a client application's perspective, the directory tree looks as illustrated in Figure 2.3, “A Directory Tree with a Root Suffix Off Limits to Search Operations”. 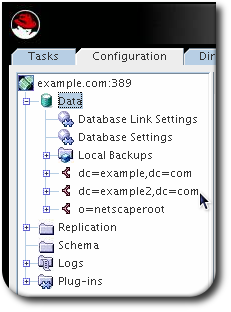 Searches performed by client applications on the dc=example,dc=com branch of the directory will not return entries from the l=europe,dc=example,dc=com branch of the directory, as it is a separate root suffix. If you wanted to include entries in the European branch of the directory tree in general searches, you could make the European branch a sub suffix of the general branch. To do this, create a root suffix for Example Corporation, dc=example,dc=com, and then create a sub suffix beneath it for the European directory entries, l=europe,dc=example,dc=com. From a client application's perspective, the directory tree would appear as illustrated in Figure 2.4, “A Directory Tree with a Sub Suffix”. This section describes creating root and sub suffixes for the directory using either the Directory Server Console or the command line. Right-click Data in the left navigation pane, and select New Root Suffix from the pop-up menu. Enter a unique suffix in the New suffix field. The suffix must be named in line with dc naming conventions, such as dc=example,dc=com. 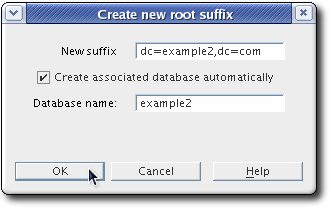 Select the Create associated database automatically to create a database at the same time as the new root suffix, and enter a unique name for the new database in the Database name field, such as example2. The name can be a combination of alphanumeric characters, dashes (-), and underscores (_). No other characters are allowed. Deselect the check box to create a database for the new root suffix later. This option specifies a directory where the database will be created. The new root suffix will be disabled until a database is created. The new root suffix is listed under the Data folder. Under the Data in the left navigation pane, select the suffix under which to add a new sub suffix. Right-click the suffix, and select New Sub Suffix from the pop-up menu. 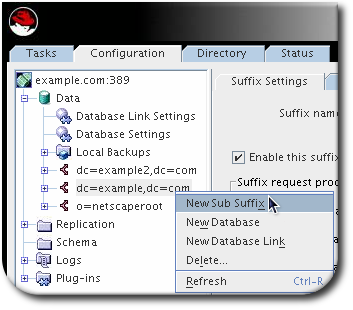 The Create new sub suffix dialog box is displayed. Enter a unique suffix name in the New suffix field. The suffix must be named in line with dc naming conventions, for example ou=groups. The root suffix is automatically added to the name. 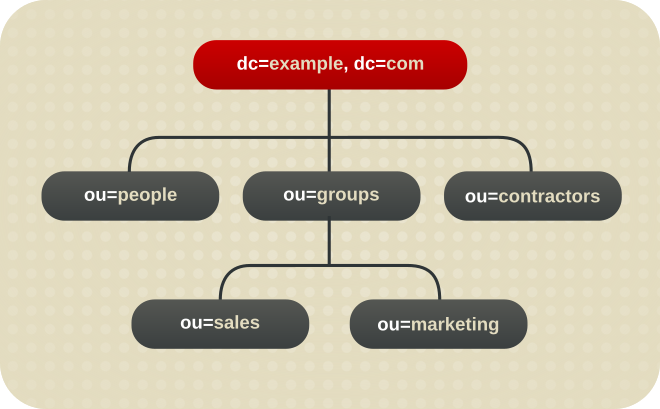 For example, if the sub suffix ou=groups is created under the dc=example,dc=com suffix, the Console automatically names it ou=groups,dc=example,dc=com. 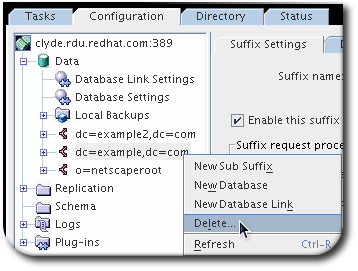 Select the Create associated database automatically check box to create a database at the same time as the new sub suffix, and enter a unique name for the new database in the Database name field, such as example2. The name can be a combination of alphanumeric characters, dashes (-), and underscores (_). No other characters are allowed. If the check box is not selected, than the database for the new sub suffix must be created later. The new sub suffix is disabled until a database is created. The suffix appears automatically under its root suffix in the Data tree in the left navigation pane. The suffix configuration information is stored in the cn=mapping tree,cn=config entry. Use the ldapmodify utility to add new suffixes to the directory. 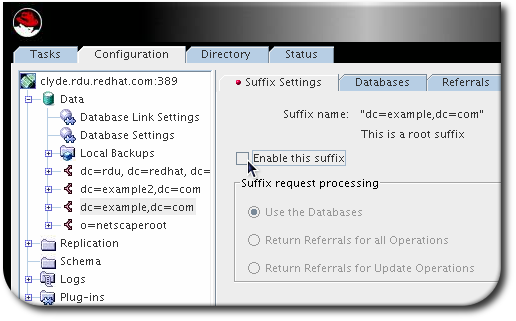 For a list of all parameters you can set when creating a suffix, see the corresponding section in the Red Hat Directory Server Configuration, Command, and File Reference. Creating a sub suffix is similar to creating a root suffix. The difference is that you additionally set the parent suffix in the nsslapd-parent-suffix. A naming context is analogous to the suffix; it is the root structure for naming directory entries. There can be multiple naming contexts, depending on the directory and data structure. For example, a standard Directory Server configuration has a user suffix such as dc=example,dc=com, a configuration suffix in cn=config, and an administrative configuration suffix in o=netscaperoot. Many directory trees have multiple naming contexts to be used with different types of entries or with logical data divisions. Clients which access the Directory Server may not know what naming context they need to use. The Directory Server has a server configuration attribute which signals to clients what the default naming context is, if they have no other naming context configuration known to them. To maintain configuration consistency, do not remove the nsslapd-defaultnamingcontext attribute from the nsslapd-allowed-to-delete-attrs list. By default, the nsslapd-defaultnamingcontext attribute is included in the list of attributes which can be deleted, in the nsslapd-allowed-to-delete-attrs attribute. This allows the current default suffix to be deleted and then update the server configuration accordingly. If for some reason the nsslapd-defaultnamingcontext attribute is removed from the list of configuration attributes which can be deleted, then no changes to that attribute are preserved. If the default suffix is deleted, that change cannot be propagated to the server configuration. This means that the nsslapd-defaultnamingcontext attribute retains the old information instead of being blank (removed), which is the correct and current configuration. In certain situations, a suffix in the directory needs to be disabled. If a suffix is disabled, the content of the database related to the suffix are no longer accessible by clients. Under Data in the left navigation pane, click the suffix to disable. Click the Suffix Setting tab, and deselect the Enable this suffix check box. If a suffix is no longer required, delete it from the database. 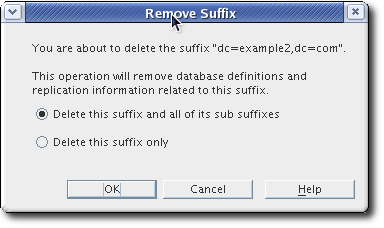 Deleting a suffix also deletes all database entries and replication information associated with that suffix. # ldapdelete -D "cn=Directory Manager" -W -p 389 -h server.example.com -x "cn="suffix_DN",cn=mapping tree,cn=config"
# ldapdelete -D "cn=Directory Manager" -W -p 389 -h server.example.com -x "cn=database_name,cn=ldbm database,cn=plugins,cn=config"
Under Data in the left navigation pane, select the suffix to delete. Right-click the suffix, and select Delete from the menu. Select either Delete this suffix and all of its sub suffixes or Delete this suffix only.